The evolution of "Milestones of Evolution"
The creative process requires making decisions. It begins with an idea, then another is added, then still more. At some point, it becomes necessary to integrate them. That requires going from the general to the specific. We call this "concept development." It's first goal is to clearly define the subject. Once that has been done, the process is one of selection. You consider all the possibilities for each element, then select the ones that contributes the most to the goal. We are usually able to move through this process rather quickly, but this poster has been a very big exception. We have long known the elements that we wanted to show, but have had great difficulty integrating them into a cohesive concept. This page summaries some of the steps. 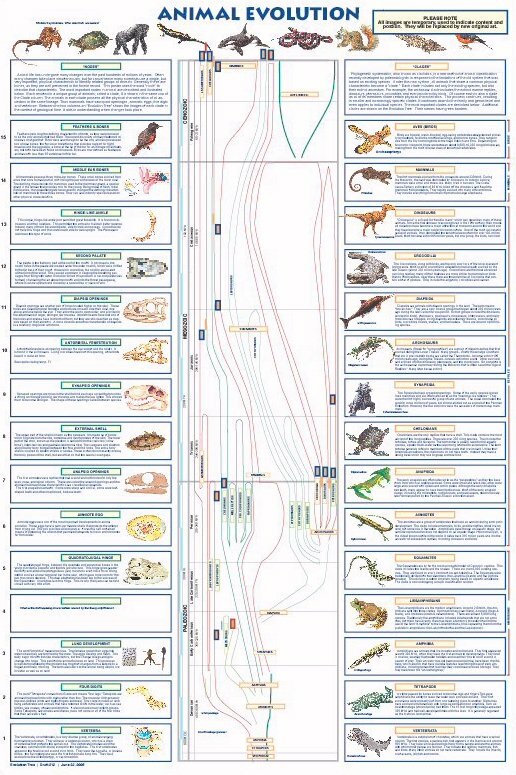 Two years ago we ran across the above diagram showing the Evolution of Life. It was a two page spread in the World Wildlife Atlas published by the World Wildlife Fund in 1985. We thought the "evolution bush" was an outstanding presentation concept. It shows how various branches split off. It is superimposed over lines indicating geological time thus indicating when events took place and the relative thickness of each branch indicates the relative abundance or scarcity of different life forms at a given time. 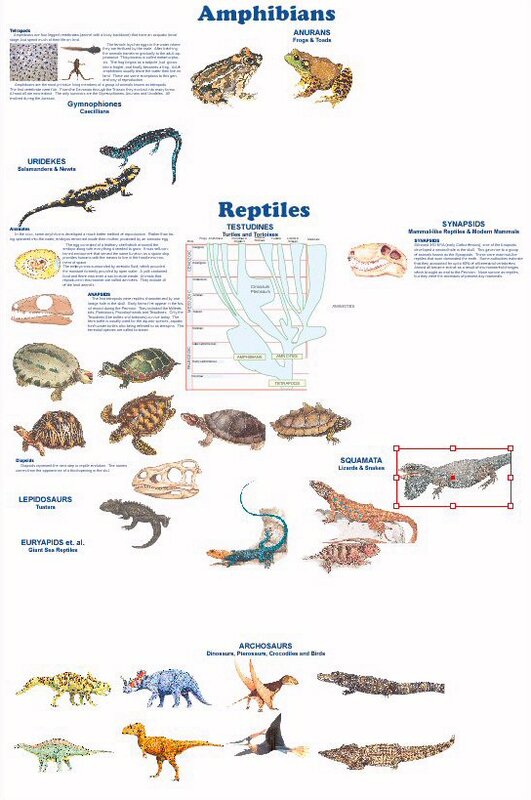 A poster is far larger and would provide space for showing far more species and detail. The above bush is now over 20 years old and is great need of updating to reflect many recent prehistoric life discoveries . We were immediately aware that such a poster would require a tremendous amount of research. This led to the decision to postpone creating it until we had accumulated research from the development of other titles. DK Publishing's Dinosaur Encyclopedia incorporates an excellent feature. It shows the physical changes that resulted in new animal life forms, which it refers to as "nodes." For example, the amniotic egg was one of the most important developments in animal evolution. These eggs have a semi-permeable shells that protects the embryo from drying out. The yolk provides a food source. It was this self-contained means of protecting the unborn that permitted tetrapods to live in environments far from water. It resulted in a new type of animal, the amniotes. The above Evolution Bush lacked nodes. We wanted our poster to incorporate them as they show why branches split off. Last year, we began working on a poster that incorporated "nodes" to show animal evolution. There was so much material to be covered that we ended up having to spread it across two posters, Invertebrate Evolution and Vertebrate Evolution. Each showed the nodes and the resulting species. As we were working on the highly detailed drafts, we recognized that these posters were too complex and detailed for the popular market. We wanted ones that could be understood by mid-school students, but yet be comprehensive enough for the college student. We want our posters to be attractive as well as informative and suitable for the mass market. Thus the highly detailed posters went on hold. Their great value was in the accumulation of so much underlying research. Four months ago, we began working on our Life on Earth Collection 3. Each of these collections contains eight titles and we try to vary the subject matter. We use the creative process described above to select the titles. We have had great success with our dinosaur posters, but wanted to do one on prehistoric mammals, as it was a subject not previously covered by any publisher. This led to the decision to do a complementary poster on the existing mammals. We wanted a bird poster and one on arthropods, but also recognized that we had not yet produced a poster on reptiles and amphibians. We explored the possibility of an overview. The main element would be existing species, but the idea of showing prehistoric species, an evolution bush and nodes crept in. It quickly became apparent that that it was simply too much material for one poster. 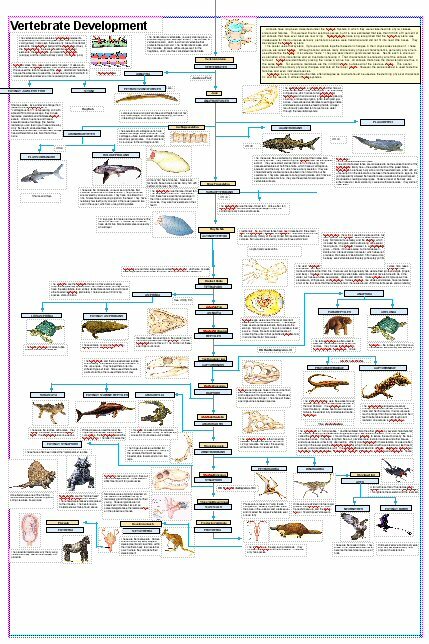 However, it did lead to the idea of doing a poster on animal evolution. We knew that would be a time-consuming project, so we re-scheduled it for inclusion in the Life on Earth Collection 4. Some of our posters come together very quickly. To fill the "reptile niche" in the Life on Earth 3 collection, we referred to our Publishing Plan, which contains a list of over 600 possible titles. It contains 18 possible reptile posters and we quickly selected one. It took a relatively short time to research and finalize content. Illustrations and production art were quickly accomplished and the poster is almost ready for print. See: Exotic Lizards. Meanwhile, we continued work on the evolution poster. The first series of drafts were based on a large tree shown in a horizontal format (not shown). It was too confusing so we came up with the 2nd series of drafts. The above is version 12. The left column shows the nodes and the corresponding right column shows the resulting species. 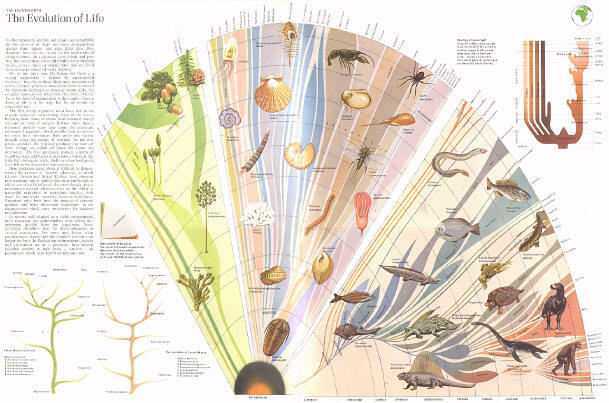 An evolution tree occupies center stage, tying all the information together. This tested well with consumers, but our marketing people felt that there was too much text. They pointed out that our two best selling posters Butterflies of the World and Dinosaur Evolution contained no text only captions. They wanted less words and more pictures. We also realize the title did not accurately describe the subject, so we changed to reflect the finalize concept: Milestones of Evolution.